Are watches the best groomsman gifts? I remember on the week of my wedding my fiance finally broke down and got something for his groomsman. He ended up getting them an antique pocket watch that we both knew nobody would ever actually use. 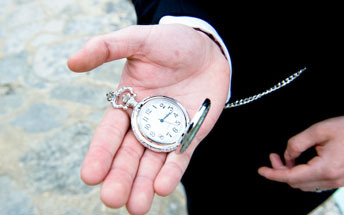 Groomsman gifts like wedding pocket watches? Their are more useful watches for guys out there.For example compass watches. Sometimes your Iphone 4 doesn’t know which way you are facing when walking. A compass watch is more accurate about telling you which direction is north or south vs your iPhone. What about those guys that are military or at least like to play Call of Duty on their Xbox 360’s. What about a Timex military watch? Then when they are playing Xbox on live or out in the woods playing paintball, their groomsman gift will actually be useful for them. When was the last time you saw a man in his 20’s with a pocket watch? Most groomsman typically attended college with the groom. In that case buy something that brings back memories of the old college days when all of you were single. Buy them college logo watch. For example, the nevada watch is both a nice stainless steel watch AND has your college logo. I’m sure that would bring back memories of how many times you ran off to Las Vegas when you should have been studying for those difficult exams. Anyway you look at it, watches make great gifts for men. Another option would be to buy some Rolex replicas and make them think they are real. That only works if you have a well paying job though. What does your wedding ring mean to you? I just read thiss story today about an Air Force pilot that lost his life during a training session and his wife’s strong desire for them to find his wedding band.. Here are some of the details below. Luckily, it has a somewhat of a happy ending…. A tragedy that claimed the life of a 28-year-old Hill Air Force Base F-16 pilot ultimately ended with a miracle. On June 22, 2009, Capt. George “Ice” Houghton, originally from Candler, N.C., died when his jet crashed at the Utah Test and Training Range, about 35 miles southwest of Wendover, Nev., during a night training mission. Assigned to the 388th Fighter Wing’s 421st Fighter Squadron at Hill, Houghton’s jet went down in a remote area of the UTTR commonly referred to as Baker’s Strong Point. Debris spread for miles from the crash site. Air Force officials combed through the site, investigating the accident and gathering Houghton’s personal items. Sheena Ratliff from Lens Flare Photos has amazed me with her talent and photography. I’ve seen her grow over the years into an inspiring Destin, FL wedding photographer. She has an eye for capturing the unfiltered emotion of a moment, the silly laugh, the tender moment, & the true relationship of a couple. Talent bundled with passion creates a photography that can transform any of its subjects into art. I added a video from her site highlighting one of the military wedding photo shoots she did below. You need to understand that in this area we have a large number of Air Force personnel by being located close to the world’s largest Air Force base (Eglin Air Force Base). She has a gift of working with military couples and understanding the kind of struggles they will face with yearly deployments and long distance relationships. If you are looking for a photographer in the Ft. Walton Beach, Destin, Navarre, Pensacola, FL area I would highly recommend her work. She also displays her clients work using this cool video software called animoto. It allows her to easily upload a set of pictures, choose a song, a let the software do the rest to create a stunning presentation of her work. What other tools do wedding photographers use to help show a client their portfolio? What are your personal favorites? Justin and Nicole…. – Click here to watch the video at vimeo. If you have time feel free to browse the different videos posted on her blog. I’m sure they will make you smile and appreciate even the simple things in life. How did these lucky ladies get a free wedding dress? 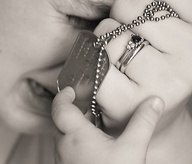 Have you heard about the Brides Across America event for Veterans Day? Trust me, those that have flocked to stores that participated around the country to get a free wedding dress. 75 lucky military brides scored a generous gift this Veterans Da in Norfolk, VA. Margaret Hasty is one of the lucky ones. Hasty spent the night camped out in front of Maya Couture in Norfolk. Along with dozens of other brides-to-be, she waited in line for the chance to snag the ultimate wedding gift, a free dress!